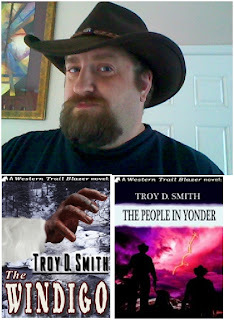 What Is A Western Writer? I didn’t grow up in the West. There were no mountains with snow-capped peaks outside my window, or streams brimming with cutthroat trout, or elk grazing on the moraine. I didn’t know what a moraine was when I was a kid. Instead, there were corn fields. Miles and miles of them. Acre after acre of giant, tall grass, always reaching for the sky during the day, and aching and moaning as it grew at night. Beyond the corn fields was a park. Mounds State Park. I could see Indian burial mounds from my back yard. We hunted for arrowheads in the fields after it rained. There were shallow rivers and creeks that ran high and fast in the spring, and low and dry in the summer. No cascading waterfalls, no deep glacial lakes. The land was as flat as a pancake. You could see a storm coming from miles away. Still, there were trees; maple, oak, sycamore, elm, towering to great heights in what remained of a once great and endless forest. White-tail deer were an uncommon sight, and the only animals we saw regularly were squirrels and chipmunks. Eagles were on coins, not in the sky. 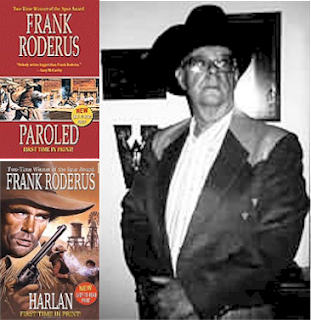 And the only cowboy I ever saw was Cowboy Bob who came on TV at 3:30 in the afternoon to introduce a half hour of cartoons; original Bugs Bunny, Porky Pig, and Popeye. The West came into our house, at night, like a welcome guest, offering a pleasant relief from the trials of the day. 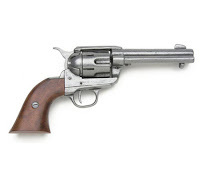 Gunsmoke, Bonanza, The Big Valley, and The Wild, Wild West, were in their first-runs. Marshal Dillon, Ben Cartwright, and James West were indelibly imprinted on my young mind. And then there were the movies, westerns all day on Saturday with Audie Murphy or John Wayne, or at the drive-in on Saturday nights. We made grocery sacks full of popcorn, sat under the stars, stared up at that big screen and learned how to dream. It didn’t matter that Monument Valley was not outside my window...the entire West was alive and well in that little black and white box that sat in the corner. TV was not an idiot to me, it was a window to the world. And later, though not that much later, the West came into my house by way of books, another window, and escape. I was lucky to grow up in a house where books were welcomed, traded back and forth among friends and family like little gifts, intended to make life a little better. Stories shared together were treasures, that were far and few between, otherwise. Paperbacks were often worn, creased and dog-eared, the books fully used up before they were put on the shelf for the final time, generally Scotch-taped together. I was lucky that what I read was not censored. Oh, don’t get me wrong, Mandingo was out of the question, but Raymond Chandler and Jack London weren’t, and I tackled them at a younger age than I probably should have. 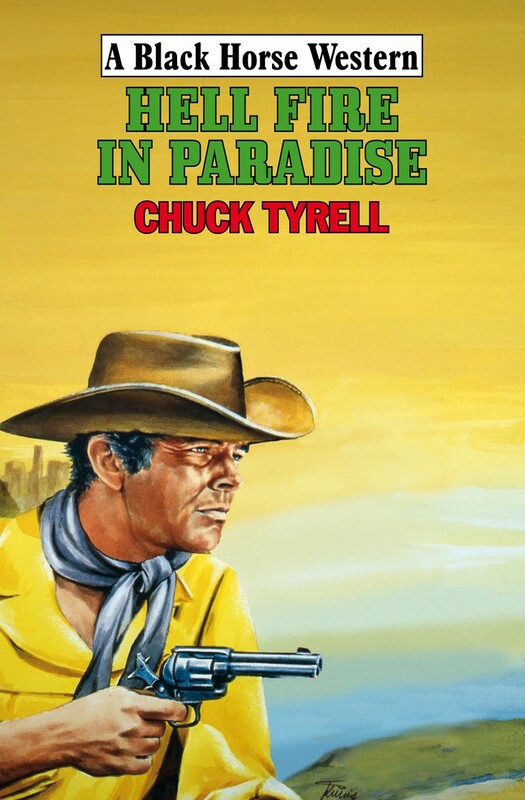 Elmore Leonard was an early influence, too. 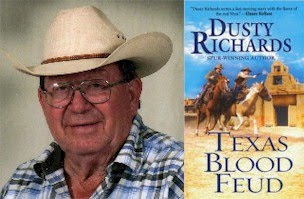 Imagine my thrill the day, years later, when I got to pick up the phone and call the man, and spend almost two hours talking about his books and writing. Talk about a full-circle moment. My first big trip as a kid was when I was 14, and I went to Austin, Texas, to spend time with my sister and brother-in-law who had been transferred there. Texas, I tell you, was the promised land. Big hats, big boots, big everything. I expected to see John Wayne saunter around every corner. It was like home, except the grass felt different on my bare feet, and the air was not as heavy, just hotter. Hotter than I had ever experienced before. And holy crap, you could drink Dr. Pepper and eat Moon Pies, and it meant you were normal. Folks where I lived turned their noses up at Dr. Pepper. Leaving Texas was hard, because I didn’t get to see everything I wanted to see on that trip. No Alamo, no Chisum Trail. No Texas Ranger. Next time. It would have to wait. And it wouldn’t be long. Basic Training for the U.S. Air Force took me to Lackland AFB in San Antonio. Back to Texas three years later after that first trip. This time I was 17, and I wasn’t on a sightseeing tour. Then off to North Dakota, Lewis and Clark country, and then back to Texas for four more years. And then back home. East of the Mississippi. To plant roots. Settle in. Grow up and start chasing the dream. I would always feel part Westerner, part Texan, part wanderer. Books, TV, and Movies went with me everywhere I went. A.B. 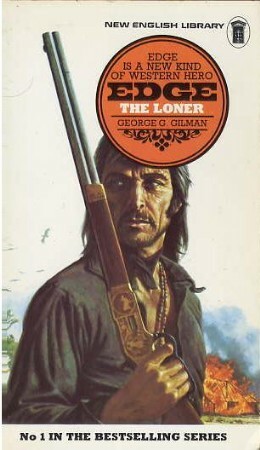 Guthrie, Owen Wister, the classics, as well as the paperbacks that hit the book racks at the 7-Eleven every month. I knew I wanted to be a writer from a young age, knew I wanted to tell stories about quests and adventures, but that’s another story. It’s not a mistake that I ended up writing westerns, it just took me a little while, and a big nudge from the universe, to figure it out. I’ve been back to the West many times since, traveling, sightseeing, but never putting my boots under the bed for very long. Someday, I may live there again. Retiring in Texas has a nice ring to it. I have a feel for the land, know the people, and the past a little bit. That helps, I think, to be comfortable. The West still comes into my house. Movies. Books. Art. And from books that I write myself, now. I may sit at a desk and view the West from a distance, but I’m about as close as one can get without being there. 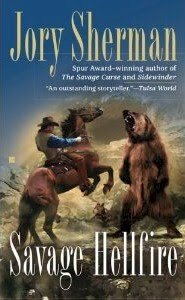 I miss the West everyday, but I get to ride the Hill Country alongside my protagonist, Josiah Wolfe, a Texas Ranger in 1874, trying to make a life for himself. The red-tail hawks soar overhead while the jack rabbits scamper for cover. Rattlesnakes ready for their prey on the shady side of a rock, and rooter skunks dig for food for their young. I listen for the fight for survival that will surely ensue, and I swear I can hear the whimper of death as the skunk succumbs. 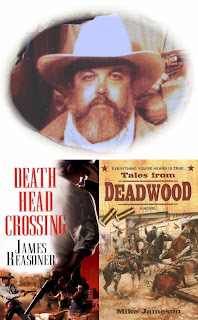 Leander McNelly lives in my world, and Juan Cortina and John Wesley Hardin, too, along with a host of made up characters, but all true Texans, I promise you. I don’t apologize for writing about a place I don’t live in. I’ve been there, spent time there, and I go there everyday in my imagination, and with the extensive research I do for each and every book that I write. The cool thing is, nowadays, I get to bring people along with me. 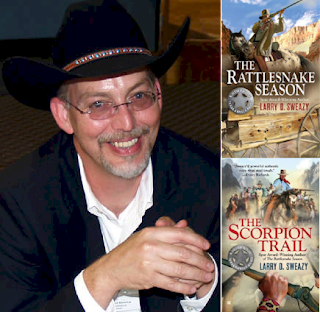 Larry D. Sweazy (http://www.larrydsweazy.com/) is the author of the Josiah Wolfe, Texas Ranger series (Berkley). THE RATTLESNAKE SEASON and THE SCORPION TRAIL are available at bookstores everywhere. 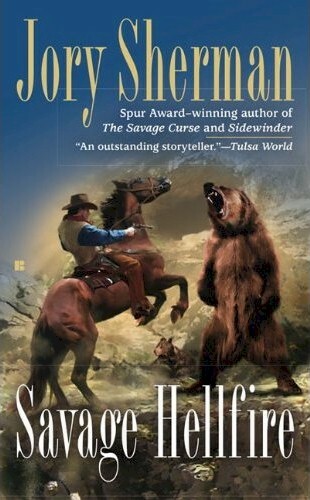 The third book in the series, THE BADGER’S REVENGE, will be released in April, 2011. He lives in Noblesville, Indiana, with his wife Rose, two dogs, and a cat. I’ve been writing professionally for 45 years, first as a newspaper reporter and for the past 35 years as a novelist. I consider this a joy, a privilege and a blessing. During the course of these years I have been asked countless times for the ‘secret’ to the writing and/or the selling. If there were such a secret I would gladly pass it on to another generation of writers. Sadly, there is no such thing. What there is, however, is almost as simple as following a secret path to writing success. It is, in short, persistence. Ideally you should be mule stubborn and Polyanna optimistic if you want to write for a living. But first – please – read. Yes, I said read. I cannot tell you how many times people have told me that they want to become writers. When I ask what types of books they prefer to read, amazingly often the response will be that they do not read. They don’t have time. They don’t have (insert excuse here). Incredible. If you do not read, you will not be able to write. Period. Next, write. A lot. You find your voice and hone it by writing. Often, perhaps even usually, I am told that the would-be writer really would write a book if only s/he had time. Hoo-ha! Everyone has time enough because no one sits down and writes a book. You sit down and write a scene, a chapter, a paragraph. Just one. At a time. Add a whole lot of those together and you have a book. I started writing longhand in steno pads. Those go anywhere without trouble. You can write a sentence in the morning while the kids are having breakfast, a paragraph on the bus, a scene while the family is at the beach. Any scrap of idle time can be productive for someone who really wants to write. Have a manuscript? Think it is good enough to market? Good. Now comes the hard part. Sell it. First, though, if you really want to succeed, do your homework. Haunt the bookstores to see what publishers are buying and which publishing houses those are. Find a copy of Writers’ Markets and study it. Do keep in mind that a great deal of lead time was built into the publication and a publisher’s needs may have changed since those entries were made. Don’t ignore the small and regional presses. Those may be a suitable outlet for your manuscript. But don’t be afraid to shoot for the stars either. If at all possible, attend a convention or two. 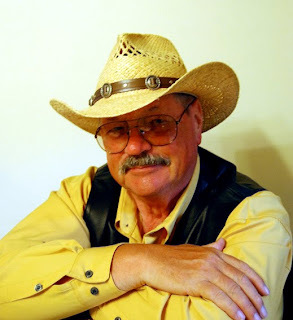 Want to write westerns? 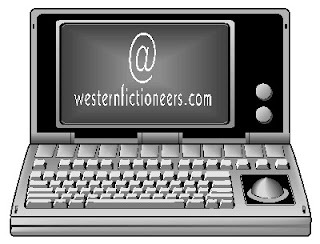 Come to a convention put on by Western Writers of America and/or Western Fictioneers (WF meets are scheduled in conjunction with WWA). I cannot stress enough how helpful it is to meet the editors who will be appraising your work. Get to know them. Ask what they like. Not just what they need but what they like. Editors are people. I know. That is hard to believe but it’s true. They have preferences and prejudices just like the rest of us. Find out what those are if possible and then tailor your mss to them. That effort can help pay off in sales. But first you must produce that ms so compelling that it cannot be turned down. I’m just sitting back and letting the mind wander which it tends to do whether I will it or not, sort of like nodding off while in the middle of a scene or a conversation or halfway through the preacher’s sermon, alas. I grow old and like some Prufrock wear the bottoms of my trousers rolled. But all decrepitude aside, I shall press on with an actual blog entry, although I like to think of it as a morsel of my own brand of idyllic mind chatter, though my non-fans (and you know who you are) might think of it as mind swill. Dear me do I digress? Shall I stop to eat a peach? I always say there is nothing better than a good old-fashioned digression. Actually I don’t always say that, in fact I don’t even know what it means. And I could care even less. Why? I write fiction, like a sailor setting out without his charts, spinning yarns and typing my manuscripts by the seat of my pants (which really looks odd at the local Starbucks) and hoping against hope I’ll not be hoisted on my own petard for taking liberties with the facts. Just the facts…ma’am. Writers get asked a lot of things by their editors and fans. Often it’s about a manuscript that might have been turned in several months, maybe even a year ago. One’s head is jam-packed with the necessary information relating to the next work in progress. And then suddenly out of the blue…. “Newcomb, Smartypants here. Say, do alligators eat raccoons?" My mind went blank. I mumbled something about Yankee woodsmiths and the curious names for children’s amusements. As soon as I returned home from the signing I dug out a copy of the book and found the passage in question. Leopard stick? What on earth. In those days I hand wrote every novel and used a typist to turn my manuscript into a finished product that I could send off to the publishing house. As luck would have it I kept the handwritten manuscript. I searched through the yellowed pages and came to at last to the scene. My penmanship was then, and still is, terrible. Dialogue and description tended to crawl off into the margins, whole passages were marked out and resembled barbed wire fences separating the sentences. And there it was. My typist making the best of my handiwork had read it as “leopard stick” and never looked back. It had slipped past me. It had slipped past all the editors. And escaped. 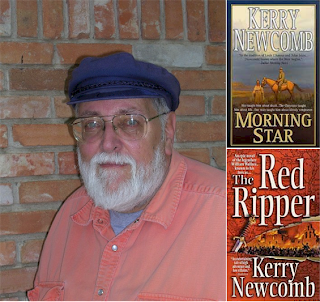 My name is Kerry Newcomb. 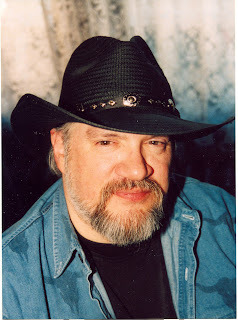 I write fiction. We are the long-stilled voices of your ancestors speaking from the past. We are echoes of those who were already here in the New World and those who came after and settled these now United States. We are the Native Americans who roamed the West, first on foot, and later on horseback. We are the explorers, the fur trappers and traders, the soldiers, the men and women who rode in wagons across the Great Plains and left our bones on silent prairies and in frozen mountain keeps. We are the people with long memories who sat by lonesome campfires and listened to the stories told under the stars. We are the ones who first saw the greatness of the land and the mingling of peoples, who found the gold and the timber and the oil, who saw life and death and greed and avarice and theft and slaughter. We are those who remind you of who you are, where you came from and where you are going. We are your conscience and your guilt. We are those who surveyed the unnamed places and put names and measurements to towns and cities and rivers and streams and mountains and valleys. We are those who followed the buffalo and the eagle, who first spoke to the Redman in sign language and died on trackless plains with dreams in our hearts and prayers on our lips. We are the chroniclers of those times when our nation was raw and young and untamed and restless and without boundaries. We are the voices of all who came westward and we speak to those now living and to those who will come after and wonder what the land was like, and who the people were and what happened over the centuries of blood and violence and progress. We are those who paint pictures with words, who relate the forgotten stories, who look into the dark caves and light a torch so that all may see what lies inside and beyond. We are those who live part of our lives in the past and ride a horse called History and who bring life to everything and everyone who died on the westward trek. We are who you really are if you will but look in your hearts and wonder. We come from everywhere and come in all sizes and shapes. We are people born of another time and place who inscribe our stories in your hearts. We are those who write down the names on tombstones and mark the olden trails so that you who read us might trace the steps of your fathers and mothers, your grandfathers and grandmothers, your great grandfathers and great grandmothers and see what they saw and wrote down in their diaries and told their children who told their children who then told us. We are the observers of both fate and destiny; the alchemists who transform the lead of the past into the gold of the future. We are the bearers of tidings, both ill and good. We are the keepers of the flame who refuse to let the old campfires die out. We are those who write down what we see and hear and feel, taste and touch so that all may know what the West really was and what it means to all future generations. We are those who never die, who live as long as words are spoken and ears will hear. We are those who see through the mists of time and walk through the valleys of shadows and wander the long prairies of memory so that you will know that we passed by all those places that are now paved over and gouged out and dammed up and slashed down and scarred and vacant of all former life, where the old footprints have been obliterated. 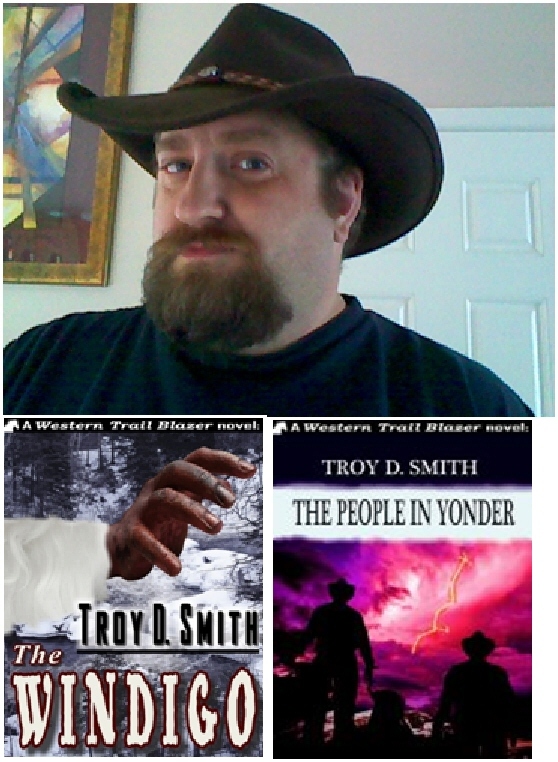 We are those now called Western writers and we are proud to carry the label. 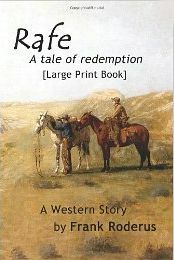 We still ride the West on a horse called History, singing our old songs and telling the grand stories of yesteryear. 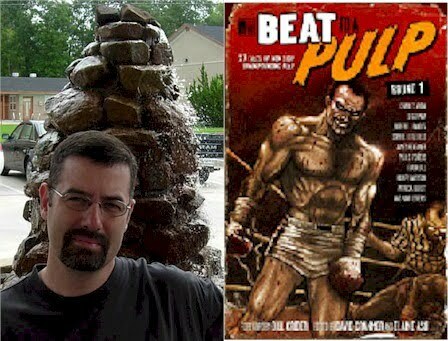 Thanks to Steve for posting about us on his website. The official website of the Western Fictioneers has gone live. Check it out to learn more about WF, including how to join. 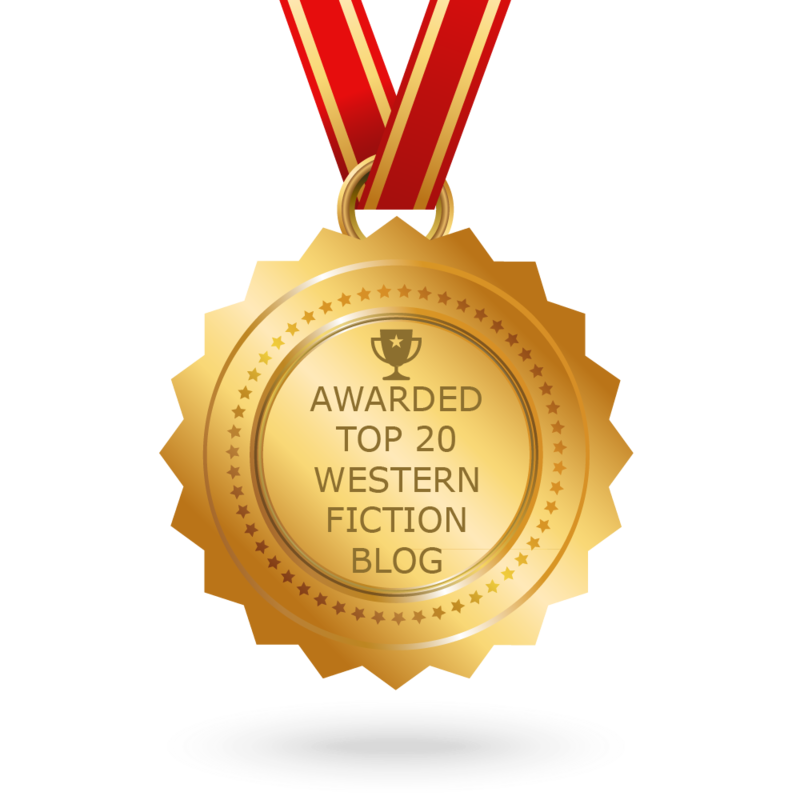 We are a budding professional organization intended to promote western fiction in general and to recognize outstanding work in this field that we love. 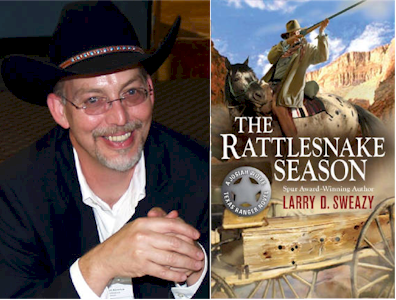 Membership is open to writers of fiction published in the western genre, novels, novellas or short stories taking place in America's old west. Those of us who founded the organization hope it will grow into a positive force for western literature, both among publishers and the reading public (bless them whoever and wherever they may be because it is toward them that as writers we direct our hearts and our hopes).